Shell disease doesn’t hurt the meat but makes lobster less marketable. The number of lobsters suffering from shell disease remains tiny in Maine — three out of 1,000 lobsters sampled last year had the disease. But scientists and lobstermen are concerned because the incidence grew fivefold from 2010 to 2012. The disease, which is not harmful to humans, first became noticeable in southern New England in the 1990s. About one in three or four lobsters caught off southern Massachusetts and Rhode Island in recent years has been diseased. Carl Wilson, lobster biologist with the Maine Department of Marine Resources, said people should be concerned but not alarmed. People who look only at the percentage increase could get spooked and say, ‘‘Oh, my god, that’s a huge increase,’’ he said. Lobster is one of the most important fisheries in New England, valued at more than $400 million to fishermen and hundreds of millions more to coastal communities. The fishery in southern New England waters has already been hurt by the so-called epizootic shell disease, caused by bacteria that eat away at a lobster’s shell. 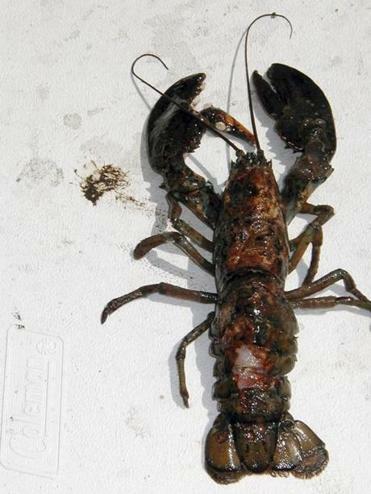 Diseased lobsters can be processed but are unmarketable in the more valuable live market. The disease stresses lobsters and can sometimes kill them but doesn’t taint the meat. When biologists first began sampling for the disease in Rhode Island, the prevalence was less than 1 percent in 1996 and 4 percent in 1997. But in 1998, the percentage jumped to nearly 20 percent; since then, it’s ranged from 18 to 34 percent a year. A similar story has played out south of Cape Cod, where an average of 22 percent of sampled lobsters were diseased from 2000 to 2011. The rate peaked at 38 percent in 2011. Shell disease could be linked to a number of pressures such as rising water temperatures, pollution, and low oxygen levels in the water, said Kathy Castro, a biologist at the University of Rhode Island. Shell disease is much less prevalent in the colder waters of the Gulf of Maine. Tracy Pugh, a biologist with the Massachusetts Division of Marine Fisheries, isn’t overly concerned about the Gulf of Maine because the waters are cold. ‘‘The rates are pretty low. We don’t see a pattern,’’ he said.